When I was growing up, the pumpkins on people's stoops in the fall were orange. Sure, people carved them up into all kinds of designs for Halloween, but the shade never varied. Pumpkins were supposed to be orange, after all. When I was growing up, kids dressed in costume for Halloween. Yes, they wore all kinds of outfits, but that's what kids on Halloween did: wear costumes. When I was growing up, kids walked up to front doors, proclaimed "Trick or treat!" got their candy, said thanks and took off for the next house. When I was growing up, kids in wheelchairs dressed up in costumes but their wheelchairs? Not so much. When I was growing up, kids with allergies were often out of luck on Halloween. When I was growing up, you were either Team Candy Corn or you weren't. People are still Team Candy Corn or not. It's The Great Pumpkin, Charlie Brown will air on TV. Moms everywhere continue to swipe the peanut butter cups out of their children’s stash after bedtime. Kids with food allergies and diabetes can look for homes with blue pumpkins, a sign that alterna-treats are offered there. Ginormous inflatable black cats, ghosts, skeletons and pumpkins have invaded suburbia. Now, kids roll around in tricked-out wheelchairs morphed into a pirate ship, boxing ring, chariot, hockey penalty box, ice-cream trucks Pac-Man, the Batmobile and basically anything you can think of thanks to inspiration from Pinterest and help from do-gooders like the Magic Wheelchair. If you have a child with autism, Sensory Processing Disorder or other sensory issues, your perception of Halloween has likely completely changed over the years: about how Halloween "should" be and how children "should" celebrate it. That's how it's been for me. I had a kid who didn't want to dress up in costume for Halloween. He just didn't get it, or find it fun. I had a kid who freaked out at our town's Halloween parade and decided home was where he wanted to be. I had a kid who needed to wear head phones when he decided to go door-to-door. I had a kid who grew into a teen who wears a plastic firefighter hat year-round and goes by the name of Fireman Max. I have a boy who took the pumpkin he picked during a school trip to a farm, painted it red—fire-truck red—and proudly brought it home. This year, it is the only pumpkin on our front stoop. It's the only pumpkin in our neighborhood I've spotted that's red, or any other color besides orange. Maybe before I had a child with disabilities, I would have wondered about a red pumpkin in place of an orange one. I might have wanted to surround it with orange ones, at the very least. But I don't think that way anymore. Having a child with disabilities shows you that children can be very different from others and still be perfectly awesome. You grow to see that a red-painted pumpkin is as beautiful as the usual one. You discover that parenting a child with disabilities can be wholly different from the parenthood you expected, yet still be plenty amazing. 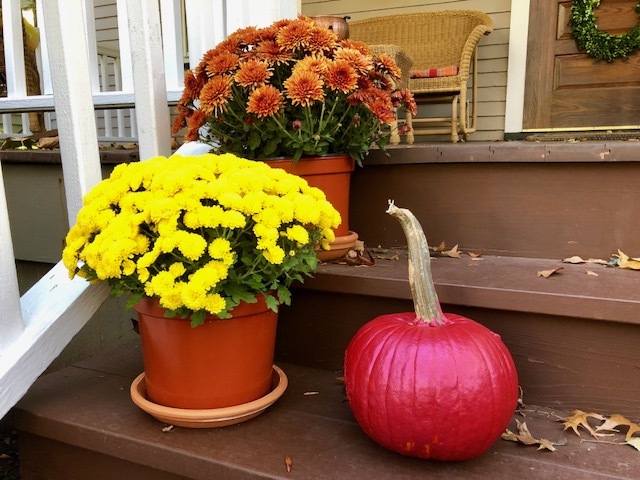 Although you never imagined having a red-painted pumpkin as part of your fall display, it looks glorious next to the mums. How is it possible, you wonder, that you once had such a limited view of Halloween? It took your child with disabilities to open your eyes. The red pumpkin on our stoop is as unique as my child and yours. It is who they are, perhaps unaware of or unconcerned about societal norms, and living life on their terms. The red pumpkin is all about what our children have done for us and those who know them: opened our eyes to the glorious range that is humanity and of course, Halloween. Whether your child goes to the Halloween parade or parties, melts down at the parade or party and needs to leave or flat-out doesn't go because they're too noisy and overwhelming; skips costumes cause they're itchy or irritating or scary or generally don't feel good, or wears just part of them; does the trick-or-treat rounds in headphones or doesn't do it all; has a parent carry their bucket for them because they can't yet hold it; eats candy or skips it because of a feeding tube or chewing challenges; or walks or rolls around the neighborhood, Happy Halloween—however you do it. Happy Halloween!!! Quick question: when is It's a Great Pumpkin,Charlie Brown on tv??? We're freaking out around here because that's a big part of our Halloween tradition and I can't find it anywhere!! What happened to it? Have a great day!! Um, I am sorry to report it was on Oct 19! Have fun today, Wen! What a nice red pumpkin Max! Excellent painting job! Firefighter Max made the best pumpkin I've ever seen!